In 2019, more and more people are making money via their own dropshipping business. The number of suppliers has increased as well, allowing you to find thousands of unique products for your store. You can have your own eCommerce store, minus the hassle – Dropshipping lets you own an eCommerce store without having to deal with manufacturing and shipping goods. With dropshipping, you only have to send the information to your suppliers, then the rest is taken care of for you. You can be creative – With your own WooCommerce dropshipping store, you can customise everything to your liking. You can also pick the products you want and come up with unique ways to market them. Low capital cost – With dropshipping, the initial costs will be those associated with hosting your website. This makes dropshipping an option for anyone who has a computer and some spare time. One major drawback of dropshipping is the time it takes to manage a dropshipping store, contact suppliers and update/confirm orders. Fortunately, we have a great solution that can save you hours of valuable time every day! 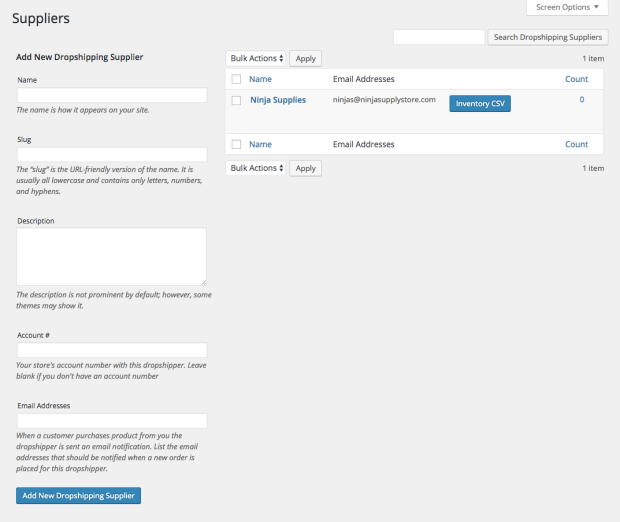 Use WooCommerce Dropshipping to send automated order notification emails to your wholesale dropshippers when new orders arrive via your WooCommerce store. It groups ordered products by supplier, and then sends them to each supplier with a list of products purchased. Your dropshipping partners can then ship orders to customers. WooCommerce Dropshipping also generates a packing slip PDF file, and attaches it to the order notification email. Your dropshippers can print the packing slip, and add it to the customer’s shipment for easy blind dropshipping. Supplier inventory can be imported from a CSV file provided by your supplier, if need be. Your suppliers, listed inside your WooCommerce. 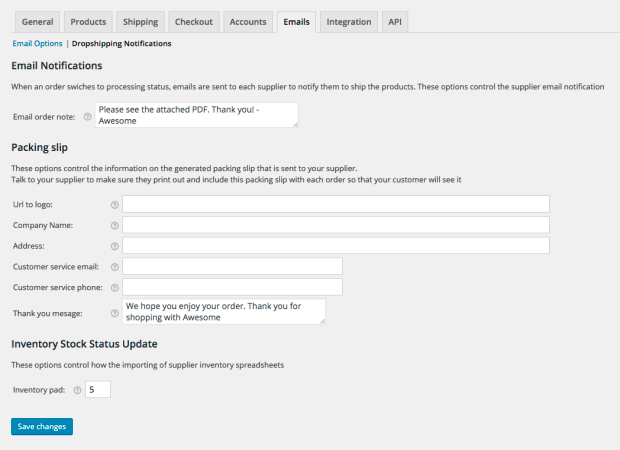 Adding a supplier to your WooCommerce, using a short form. Set up your email notifications for your drop shippers. How will my drop-ship supplier bill me for the order? Often a supplier will allow for NET 30 or may a your credit card on file. Ultimately how this happens is between you and your drop-ship supplier. At OPMC, our speciality is creating, managing and improving online eCommerce businesses. 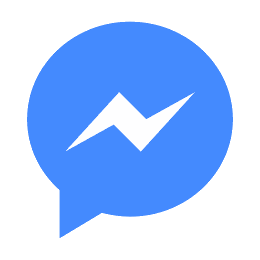 This is reflected in our great hosting options, custom plugin development and website design services. Click below to learn about the services we can offer to your eCommerce business.